The past number of years has seen an unprecedented wave of creativity applied to not for profit digital campaigns and social channels. As marketers in the online world increasingly recognise that digital and the role of social channels is much more about the company ethos, adding value and working on the peer-level to ‘give back’; it is perhaps easy to understand why not for profit Digital Communications are resonating with audiences and winning awards. Our action on your website looks like this: 51% use it as a platform to connect via social media, 46% to donate and 46% to read a blog post. Get your website structure right and remember that Content is KING. 70% of Millennials prefer to give online, but it might be surprising to learn that we aren’t that in to text-giving (only 15% have done so). Yet we do like to act immediately – these points combined highlight a preference for ‘giving recognition’. Perhaps text-giving doesn’t adequately promote my good deed? Last year, UNICEF re-invigorated the hugely successful ‘Tap Project’ whereby restaurants would ask patrons for a $1 donation to help provide clean drinking water in Africa. Now, while the updated campaign does not have the beautiful and direct correlation regards ‘my water, for your water’, it does talk to social behaviours and asks us to question what we’re focusing our time on by challenging us to give up access to something far less vital than water–your cell phone. To our point about the necessity to engage younger audiences, how about empowering them instead? Really empowering them. After all, it is the younger ‘digital native’ audiences who understand best how this all works. The UK’s RNLI demonstrates how you hit a home run with content marketing, blogger outreach and leveraging online mediums – and it’s a far cry from collecting pennies in boat-shaped boxes at the dry cleaners. 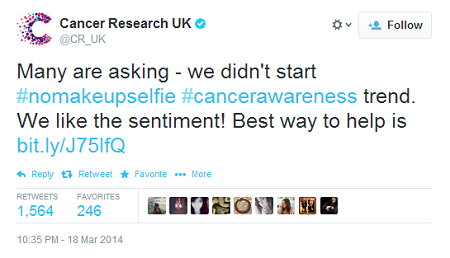 First up, the hashtag #nomakeupselfie started to trend on twitter. Why? Because it spoke an organic truth to the demographic. Ground had already been broken by movements in anti-airbrushing and brand campaigns such as Dove’s ‘Campaign for Real Beauty’, so a level of empowerment and duty was already in place and it’s no surprise that all such examples have powerful imagery and tones of ‘anti-establishment’ or ‘anti-societal-norm’. That’s empowering stuff. Nobody could identify the source of the hashtag. However, the empowered twitter folk were now already so engaged and so motivated that they themselves began asking ‘how to donate’. 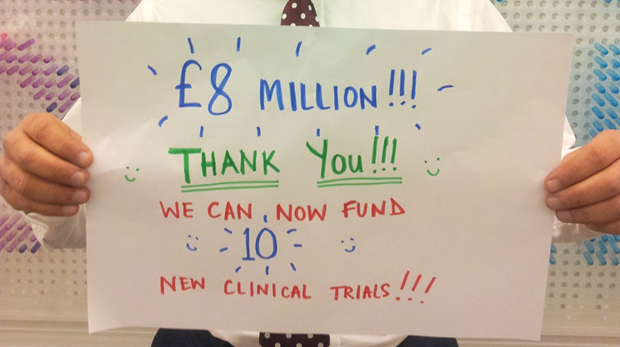 Step up Cancer Research UK to put themselves forward. 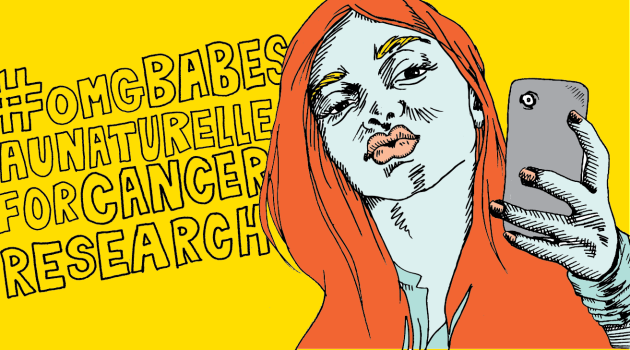 Following a barrage of retweets, PR coverage and consumer donations, the organisation expertly followed up with celebrity stories and local activations all documented online via the existing hashtag and the new conduit: #NoMakeupSelfieForCancer – whether initiated or not, the pace at which the organisation joined in is to be admired and respected, as too are their sincere (now viral) ‘thank you’ messages. I came across the movement a while ago and recently, it has been getting more and more attention and started to pick up awards. Aside from the primary point that this is of course a mission worthy of everyone’s attention, I’m raising the point that a really well-honed content strategy. The simple, informative information that often gets missed. 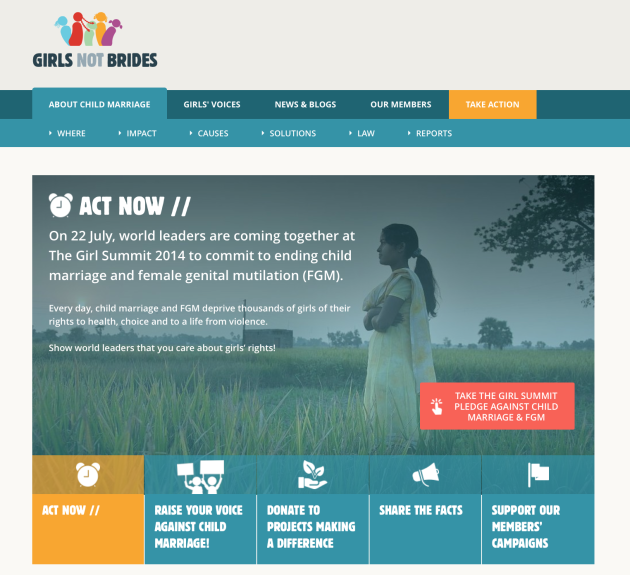 At www.girlsnotbrides.org, the mission is clear and the stories are real. Add to this tools for visitors, students and teachers to get involved and you’re well on the way to a long-lasting platform that can truly be the daily catalyst to changing something that needs changing.